Motor Trend’s Jessi Lang says she is a journalist who wants to help “build relationships” between that publication and its readers while covering the auto industry. 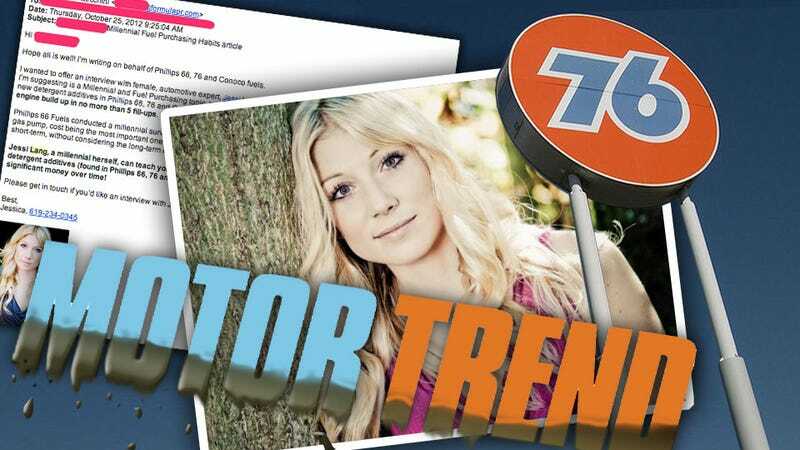 She’s also being paid to represent oil company Phillips 66 as a spokesperson who is trying to help influence young people to buy their gas, something Motor Trend doesn’t appear to be telling its readers. Last month a PR firm hired by Phillips 66 — which sells gasoline through brands like Phillips 66 and Conoco — reached out to reporters with the results of a survey designed to evaluate the buying habits of 21-to-30-year-old “millenials” and offered up a quote from Jessi Lang, who they identified as a spokesperson and host of Motor Trend’s weekly automotive news roundup “Wide Open Throttle” on YouTube. To the credit of the editors who received this pitch, I haven’t seen anyone from a major publication write anything about it. I requested an interview with Lang to discover what insight she may provide and also to find out why she might think working simultaneously for Phillips 66 and Motor Trend was acceptable. Lang is currently working on a PhD in Cultural Studies at George Mason University and has a Masters in English from the same institution. Since 2009, she’s worked in the auto industry formerly writing for Roadfly.com. So, where does this interest and expertise in fuel and fuel additives come from? “My understanding of additives came from my grandfather, who taught me the importance of additives,” said Lang. I asked her if it was proper for her to take money from Phillips 66 and work as a journalist for Motor Trend at the same time. Lang also said that “anyone within a capitalist society” should be compensated for their work. Shortly thereafter I received a call from Formula PR’s Tara Reid (she was unwilling to give me her last name when she realized she would be quoted, but I was able to determine it after learning her email address). She was upset that I had asked those questions and wouldn’t confirm if Lang was being paid directly by Phillips 66 or by Formula PR. I sent a follow-up email with questions Reid was unwilling to answer on the phone, but as of publication I haven’t heard back. I also reached out to Motor Trend’s Editor-in-Chief Ed Loh both through email and on Twitter to ask him if this is standard practice, to confirm that he approved this campaign, and ask whether he saw it as a conflict of interest. Loh has, so far, declined to acknowledge the questions. There’s also video of Lang visiting online tire retailer TireRack for Motor Trend, which feels very much like an ad for the TireRack, but we’re never told if there’s any editorial-advertising tie-up, although the TireRack is the official tire and wheel provider for Motor Trend and promotes “editorial” content that’s also basically advertising. With all the grey areas in modern automotive journalism, and with Motor Trend’s many advertorial tie-ups, is Lang’s behavior actually wrong? “It’s a very blurry line... but it certainly gives you pause,” says Tom Appel, President of the Midwest Automotive Media Association and Publisher of Consumer Guide Automotive. According to Appel, to the best of their knowledge they’ve never had a member take money from an auto-related industry while also reporting on it. Motor Trend, Jalopnik, and most other automotive publications accept free or reduced travel frequently. Though we disclose the travel we receive, it’s still not a commonly accepted practice in most journalistic circles outside of automotive and lifestyle. Nothing I’ve seen from Lang directly relates to fuel or fuel additives, although Motor Trend has covered the topic and has a section on gas prices. “if you think about buff books, especially Car And Driver and Motor Trend, they’ve done a great job covering the petroleum industry and you’d hate to see that compromised in any way even by simple finger pointing,” says Appel. You could also argue what Lang does isn’t journalism, but infotainment, yet Lang asserts she’s a journalist and mentioned journalistic integrity when I spoke with her. There’s also a revolving door between PR and journalists with writers and editors going back-and-forth between auto companies and auto publications, although I can remember no case where someone was working for an automotive company and an automotive publication simultaneously. An exception is also frequently made for race car drivers who write for publications because their other job requires working with sponsors, typically automotive ones — Motor Trend has this issue with Justin Bell and we have it with Robb Holland, Alex Lloyd and Bill Caswell, although we try to make it clear when they’re writing about sponsors (and Lloyd isn’t currently racing). The exception in this case comes because we value the insight they have as race car drivers and people generally understand, even if it isn’t disclosed, they have sponsors just like any other athlete. Motor Trend hasn’t made clear that one of their employees is taking money from a company in the automotive space and won’t even comment on it. We don’t know if Motor Trend made an exception for Lang or if other writers also take money from organizations the publication covers or could potentially cover, because no one there has answered our questions. In the case of Lang, Motor Trend, and Phillips 66 it seems they’ve skipped ahead from trying to woo car writers with free trips to paying them outright.